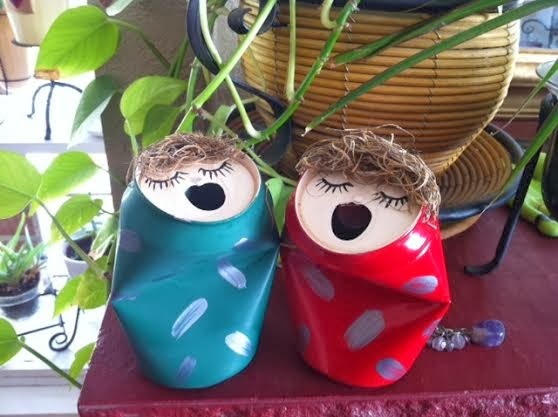 While digging through my holiday decorations I found something I created many years ago... Can Carolers! My sister and I used to make and sell these at craft shows. I'm really glad I held on to a couple of them. They were easy and fun to make. 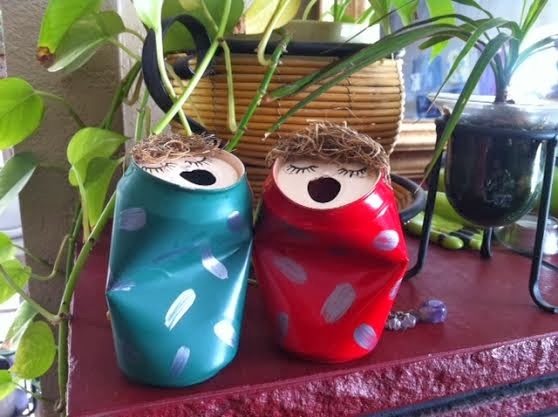 They were also a big hit at the craft shows. I've listed supplies and instructions below so you can make your own. If you do make them, I'd love to see photos! The carolers pictured are free standing, but we also made them with string attached to hang as ornaments. Completely remove the pull tab. Use a metal file to smooth any sharp edges. Using your hands, press to dent the soda can. Not too much, or it won't stand up. Spray paint the can. I used a gloss paint. Paint and/or glue decorations on the "clothing" portion of the can. Use a paint brush to paint the "face" of the can. Use a sharpie to draw the eyes on the face. If you plan to hang them as ornaments, hot glue string where you plan to put the hair. Hot glue moss for the hair.